The hot dogs sunbathed on lounge chairs by the pool, sweat seeping through their casings, as chicken tenders splashed and squealed and bobbed in their inner tubes. The Isla de Encanta Resort was mostly chicken parts that day—legs and breasts and those few baby tenders. “You can’t tell me they’re not on steroids. That kind of muscle does not happen in nature,” Omar said to Mitch of the two plump legs leaning against the bar. Behind the lounge chairs and beyond the hedges lay tropical seashore. 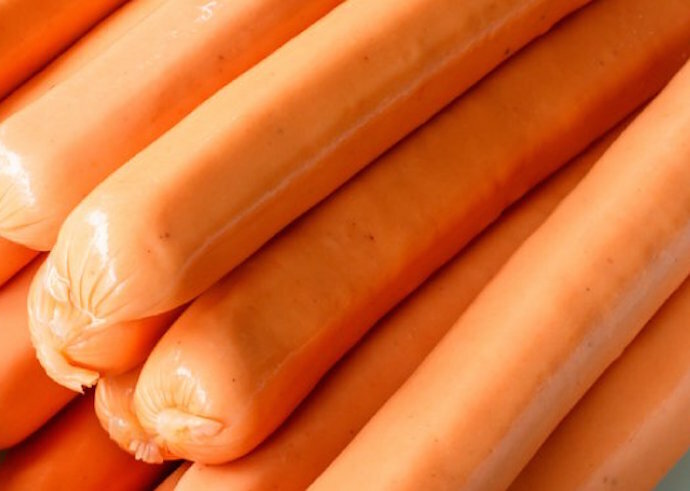 When the hot dogs got to feeling oppressed, by heat or other meat, they would go for a walk to cool off. Today the heat threatened to blister them, so they didn’t just walk, but went for a swim, too, even though the sea crowd was touchy about land types entering their territory. There, floating navel-up in the ocean, Omar saw a dark flock in the sky. It wasn’t pheasant drumette. It wasn’t goose gizzard either. Whatever it was was thin and moved rhythmically, waving more than fluttering. The best he could tell it was a fever of manta ray wings, but manta ray was strictly ocean. As the disks approached, their outer edges rippled in the wind. The hot dogs dipped underwater as the flock sailed past, just ten meters above. The hot dogs returned to shore, snuck up to the hedges and peeked through. Salami was everywhere molesting the other meat as was its way, but it had skipped the warm up—the gauche pick-up lines and suggestions of experimental copulations. One baby tender had been totally blanketed by a slice and was invisible from the inner tube up. Legs and breasts everywhere shimmied in an effort to peel free of them. By the pool house five slices smothered one particularly attractive breast; nothing showed of her now but a painted toenail. “Those little fowl-fuckers,” said Mitch. “There has definitely been some cross-breeding going on,” Omar said and then retched. They turned and ran. Not five meters into their escape the hot dogs were accosted from behind. Omar smelled the slice’s putrid oil on his semi-permeable skin. He flipped and flopped and covered them both in sand, and then, with a twisting dive into the ocean, the slice slipped free. “To the water,” he yelled to Mitch who fought his way over. As both attackers turned to easier targets on shore, the hot dogs swam to the buoys and bobbed in silence, hoping to blend in. They watched as each of the resorts along the shore turned dark with salami slices. “Did you listen to the news today? Or hear a warning siren?” Omar asked. Within the hour the nibbling began. Dorado fillets were first to dig in, though even when swordfish steaks joined them, Omar and Mitch felt more dread than pain. The hot dogs held hands as their bottoms dropped out, Mitch praying to the meat gods to come back as a shark slab—a cigar-smoking, dorado-eating chunk of great white—and thinking his odds were pretty good, and Omar waxing philosophical about the way his death—the unpacking of his chunky innards, his slime and slurry deliquescing out like an oil slick—was happening bit by gory bit, much like his birth in reverse. Kara Vernor’s fiction has appeared in Wigleaf, Hobart, No Tokens, Green Mountains Review, and elsewhere and has been included in Wigleaf’s Top 50 Very Short Fictions, the Best Small Fictions finalists, and Outpost 19’s Golden State 2017 anthology. She has received scholarships from the Elizabeth George Foundation and the Mendocino Coast Writer’s Conference, and her fiction chapbook, Because I Wanted to Write You a Pop Song, is available from Split Lip Press.